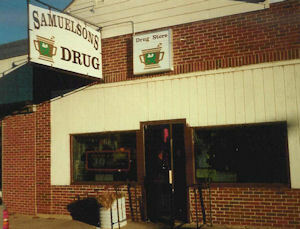 Samuel's Drug Store wasn't always under the Samuelson banner. 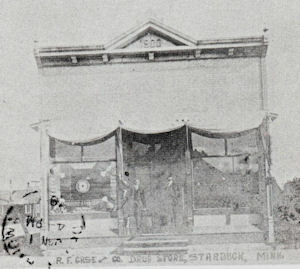 The frist drug store in Starbuck and one of the first buildings in the Village was the Day's Drug Store located close to 108 East Broadway. This building was later destroyed by fire. In 1885 O.J. 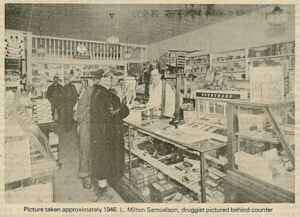 Johnson moved to Starbuck from Glenwod and established a drug store east of the present day drug store. Mr Johnson was one of the leading citizens of the village and held the position of President of the Village Council. 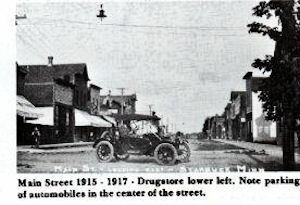 The lot where the drug store now stand was purchased by R. F. Case from O. J. Johnson in April 1899. 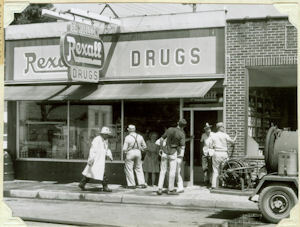 Mr Case constructed a new building and operated the drug store from that location. It was completed in 1900 and had a center door with wooden steps up from the sidewalk to the wooden floor which was kept oiled to repel water and muddy shoes. A show window on each side was decorated with crepe paper and advertising signs, such as "gall cure for horses, liniments for men and beasts". One large bottle of liniment was "two-bits" or 0.25 cents but Hamline Wizard oil was 0.50 cents. Total sales went as high as $5.00 per day but Mr. Case was by no means idle. He had a swift grinding mill for reducing roods, rhizomes and barks to powder for percolation. Some prescriptions called for Many ingredients to be mixed in powders. Customers would leave the prescription and return in an hour or so receiving twelve hand folded powders for 0.25 cents. Small quantities were ingredients adjusted to needs of the patient came to 0.25 cent for a half ounce jar. Business was so good about 1917 that R. F. Case and his son Wilson R. Case acquired a partner named C. A. Stocking. 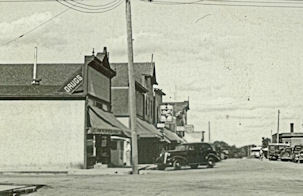 However, they sold the property to George Arneson on August 14, 1922. The depression and the dry dusty years occurred during his ownership. 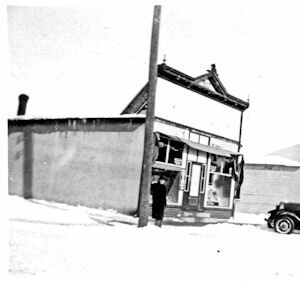 In 1934, Alex L Kapsner became the owner and pharmacist in Starbuck MN. In remodeling, he had a new roulded cement step built on the front. Duing his ownership, the Dionne quintuplets were born in Canada and each year of teir growth was displayed with a lrage picture in the stoe window as an advertisement for Rexall Cod Liver Oil. During World War II the wonder drugs (sulfa and penicillin) were introduced in limited suppy toopen a whole new era in the drug world. 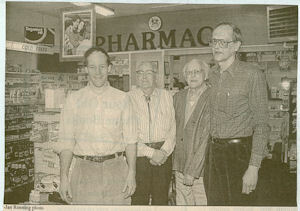 In 1978, Ted Samuelson son Donald Samuelson was included in the partnership as a pharmacist. Today there are many new wonder drugs, antibiotics in plenteous supply. If Mr. Day, or Mr. Johnson or Mr. Case could come back and have a look at the prescription room today, it is doubtful that theywould recognize many of the drugs there. However, some of the old standby patent medicines such as Kuriko, peruna and Lydia E Pinkham are still found in the shelves.